New models from Jordan Brand are expected to dominate this year 2012, but their retros will also stole some spotlight like the one that is set to come out this summer. 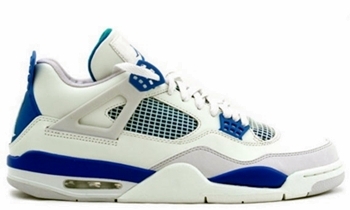 Jordan Brand recently announced that the Air Jordan 4 Retro will be released in a “Military Blue” edition on June 9, 2012, which boasts a white leather construction enhanced with military blue and grey accents on different parts of the shoe. This one looks very simple, but it is definitely worth the $160 you need to spend for it!